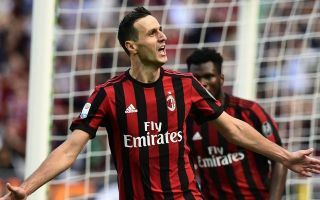 AC Milan are reportedly scheduled to meet with Nikola Kalinic’s agent as the Croatian international could edge closer to an exit from the San Siro. It’s been a real struggle for the 30-year-old this season, as he’s managed just four goals in 32 appearances after securing a move from Fiorentina last summer. Youngster Patrick Cutrone has leapfrogged him in the pecking order, but surprisingly, Gennaro Gattuso has opted to stick with Kalinic over Andre Silva at times despite his ineffectiveness. According to Calciomercato though, it’s claimed that he’s not happy with his current situation at Milan having not played as much as he expected, and his agent, Tomislav Erceg, is set for a trip to Milan in the next week to discuss his future. Given his inability to make a positive impact coupled with the emergence of Cutrone, it would be a surprise if Milan didn’t opt to try and cash in on the veteran striker and reinvest. Selling him without a replacement lined up wouldn’t be advisable though, as Gattuso doesn’t have a great deal of depth in that department as it is. Meanwhile, one exit that many Milan fans will not want to see materialise is that of Giacomo Bonaventura, regardless of whether or not his form in recent weeks has dipped alarmingly. The 28-year-old has looked a shadow of his usual self, failing to have an influence on Milan’s play and losing his decisive touch in the final third. As per Calciomercato, it’s suggested that not only have negotiations over a renewal stalled, but his agent Mino Raiola is offering him to other clubs and there is a hint that the right offer might convince Milan to sell. Bonaventura remains a popular figure at Milan given he was a leading figure even through their struggles in recent years. Perhaps a positional switch would help him as he hasn’t looked effective on the left of a midfield three in recent weeks, but something may have to change before the summer to avoid this rumour gaining more credence.